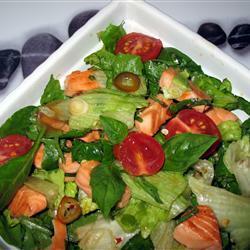 Salmon is a great seafood item to make a salad with and today you will find numerous salads with salmon. One such salad is called Salmon Salad with Thai Dressing and it has made its mark with splendid taste and fancy dressing. This salad takes only a little time to prepare and in addition to that, it is quite filling as well. Another added advantage of making Salmon Salad with Thai Dressing is that you can dish this up right away after cooking, as there is no need to refrigerate it unlike various other salads. Those who would like to make Salmon Salad with Thai Dressing and try its amazing flavour can take help from this guide. First you will prepare the dressing with the combination of chopped chillies, fish sauce, sugar and lime juice by placing them in a small bowl. After combining these ingredients leave them aside. Then, take salmon and use olive oil to rub it in a baking tray. After rubbing it place the salmon in a preheated microwave oven and bake it for 20 minutes or until it can be easily flaked. When the baking is done allow salmon to cool down for about 15 minutes at least. After that take a large bowl and put salmon into it. Now grab a fork and break this fish into large pieces. Then add basil, onion and tomatoes to it and subsequently put the dressing over salmon and other ingredients. When the dressing is poured then, toss this mixture lightly until gets mixed well. Take lettuce leaves and put them in a plate and then, place this salmon mixture over them after which you can serve this salad immediately.